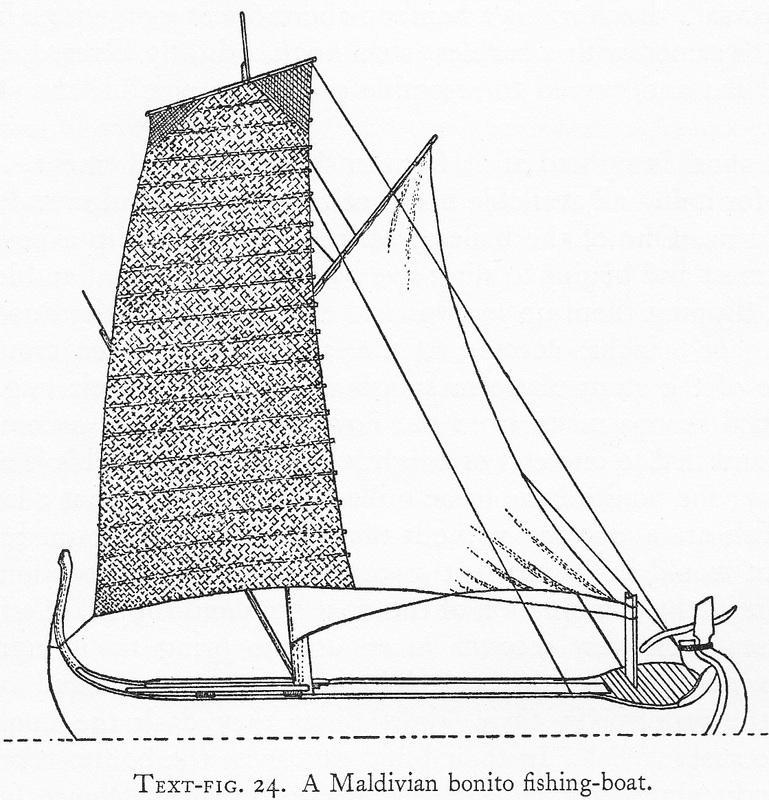 The two compartments fore and aft of the mast each had four to six plugged holes in the bottom, which, when the plugs are removed, allowed them to serve as livewells for bait. These livewells were managed in a curious manner, described below. 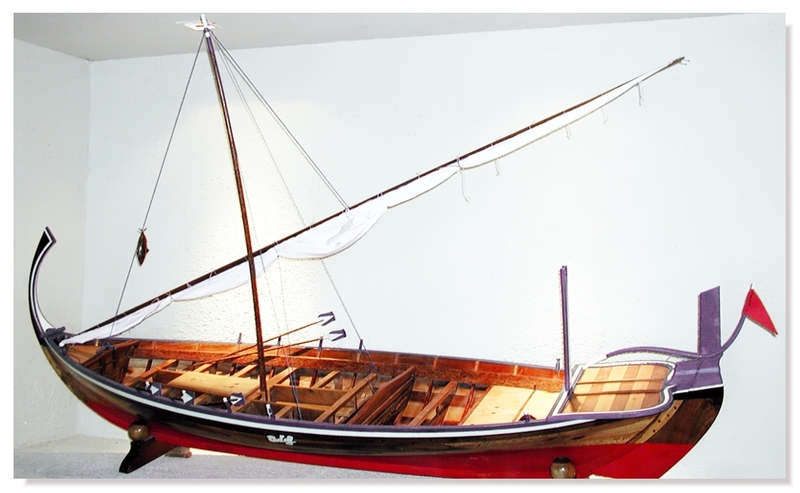 Although somewhat similar dhonis, with transverse bulkheads and the aft platform extending over the sides, remain in use in the Maldives, none of the recent photos we’ve found show the old style bonito boat’s distinctive double-curved stemhead, recurved sternpost, or mixed squaresail/gaff rig. Lateen rigs are the norm in existing boats (or at least, those that are not motorized), and the stemheads curve sharply aft, with no hint of reverse curve. 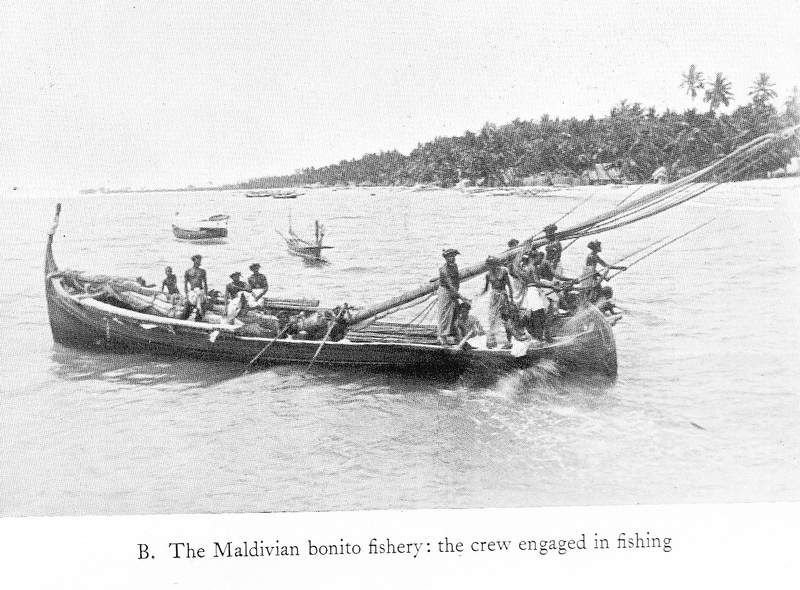 Before bonito could be caught, the same boats were used to catch baitfish. A square net was fastened to long poles and lowered to the bottom of a lagoon. Ground bait (bait for the baitfish) was dropped over the net. When the baitfish came to feed, the net was raised. Presumably this was repeated many times before sufficient bait for a bonito fishing trip could be accumulated. The live bait was kept in a huge basket in the lagoon until it was time to go fishing in earnest. 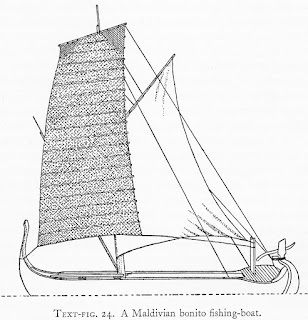 In addition to two bailers, the crew consisted of several anglers with fishing poles, a helmsman, four “splashers,” and three or four boys to tend the squaresail. The poles were about six feet long with a line of about six feet fixed fast to the end. Barbless hooks of bright steel at the end of the lines were shaped to resemble baitfish. Bonito fishing in process. Note the heavy splashing around the aft deck. But successful the ruse was. The anglers, crowded upon the stern platform, would drop their unbaited, lure-like hooks in the water and yank bonito from it directly into the hold. The barbless hooks could be disengaged merely by slacking the tension on the line for the briefest moment before they were returned to the water with scarcely a pause. In an active shoal, a man might average one catch per minute, and a boat might catch a full load of 600 to 1,000 fish in two or three hours. The boat owner received 21 percent of the catch as his share, the rest being apportioned amongst the crew. That which was not eaten fresh was cured for later use or for trade by a combination of boiling, smoking, and sun-drying.